Well, I may as well start off the new year with an apology. I was looking back through old email for a particular message and I happened across a photo I had never posted to the blog. I am so sorry!!! 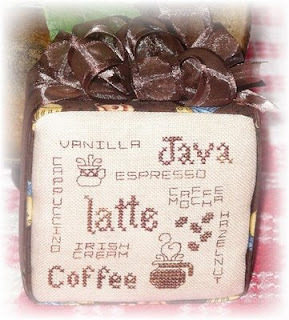 Michele sent me an email to let me know she had posted a photo of the Coffee Mug Mat stitched and finished into a cube by her friend Karen. I wrote back and asked for permission to post the photo here and she said yes, but somehow I failed to get on here. So a little late (okay, a lot late!) here it is! Thanks, Michele, for sharing the photo and thanks, Karen for stitching and finishing the design and for continuing to accept me in spite of my bad manners! I love this pattern and the finish! It's me again - late but I LOVE this chart and finish.